As a young boy Joey grew up on a Hay farm in Arizona where he worked with his family on Burns Brothers Farms. He later attended Olivet Nazarene University where he played football and graduated with a degree in business and communications. He returned to the family farm and married his childhood sweetheart Michelle. In 1994 they left their family and friends to start new lives in western Colorado, where Joey began to sell ranch real estate. As their lives began to change so did their family. They were blessed with five children; Brayden, Brittany, Bryce, Landen and Luke, who have been home schooled. 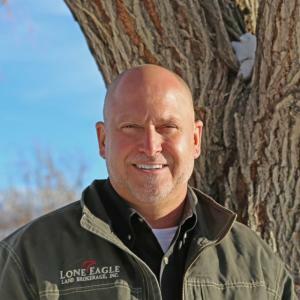 Joey progressed in the real estate community and became the proud owner of Lone Eagle Land Brokerage. His business continued to expand as Joey introduced a mapping and aerial photography company known as Land Information Systems. In addition to selling real estate Joey has had a call for missions. He has enjoyed leading philanthropic adventures to Nicaragua, Brazil and Ecuador. Joey is also the chairman of the board for Samaritan Aviation, a medical mission based in Papua New Guinea. Joey loves his work as a real estate broker, business owner and Father, and it is his goal to treat his clients with the highest level of integrity and professionalism. Great, productive ground on the mesa in Olathe. The property offers 115.7 shares of UVWUA water and a quaint 1920's farm house. A must see! Offered for the first time since 1951 this 149± acre irrigated farm is very conveniently located. Located on the lush Spring Creek Mesa, this property features an abundant 133.8 shares of UVWUA irrigation water, making this farm ground some of the most highly productive ground in the area.